Ever feel like everyone else is out in the world living life better than you? This is certainly not an everyday feeling, but on occasion it crops up. I blame social media and the constant comparison to a curated life from people who I usually don't even know. I know you're thinking, "Wow Morgan, what a concept! We've heard this before!" You're right! You have heard this before — we all have! Yet here I am, still writing about it because it still exists. I took a few months (okay, nearly a year) off from blogging. It didn't happen on purpose, and the break isn't something I'm exactly proud of. But in the time away, I realized blogging was really a thing I did for me that also happened to benefit the people in my life near and far. I became a better cook, writer, thinker, and creator. I even became a better partner to my now husband and a better friend and neighbor. Creating this post reminded me of all the reasons I love keeping this blog with Katie. First of which is sharing a thing I love, without the expectation to be perfect, and without the comparison of other cooks, bakers, and bloggers. Sure, I draw inspiration from them, but unlike my career life and, sometimes, my personal life, I really just do this for me. I truly missed it. 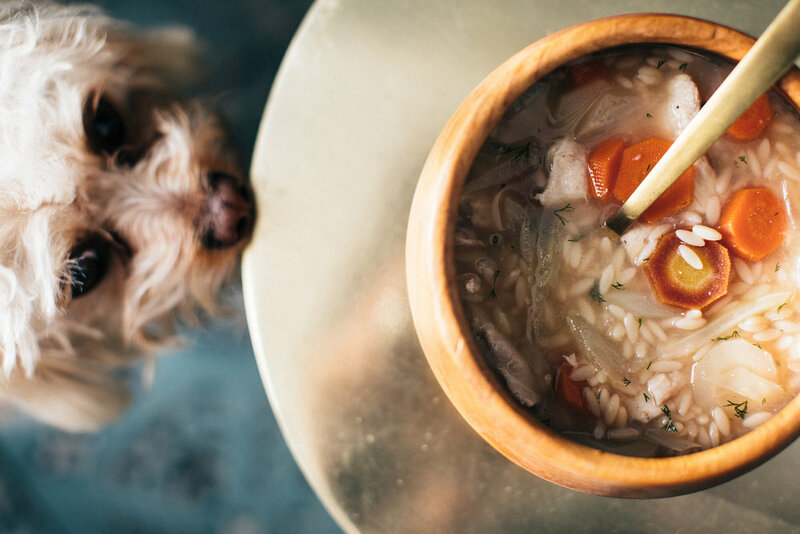 Lemon orzo soup is by no means a groundbreaking combo. There are dozens of versions splattered across the internet and in cookbooks. But this is the soup I brought to our close friends Mike and Monika when both their kids were sick. It's a symbol for comfort and for all the reasons this blog has made me better. Because it taught me to share, to be open to learning new things, and to be unafraid of imperfection. For all these reasons, and many more, I promise not to be gone for so long next time. In a large soup pot, combine broth, salt and pepper; bring to a boil over high heat. Add carrots, fennel and orzo; bring to a boil. 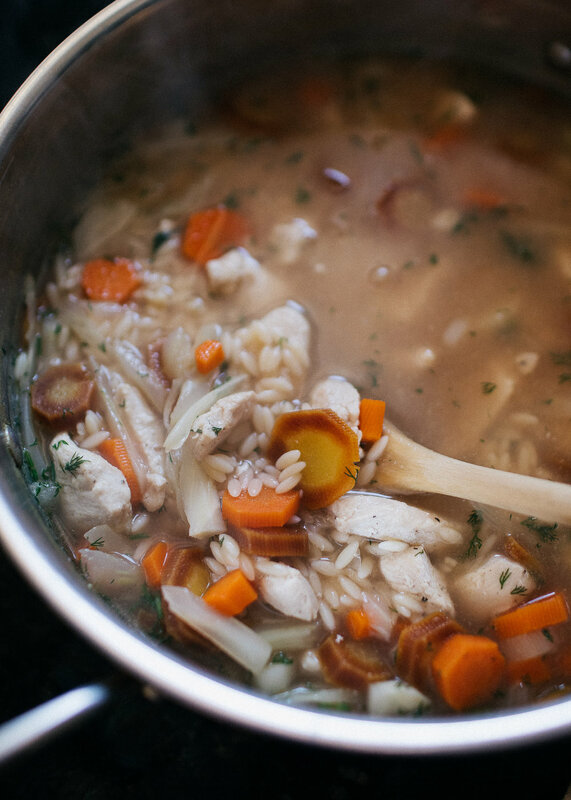 Reduce heat to low and simmer, partially covered, until orzo and vegetables are tender, about 8 to 10 minutes. Stir in chicken; cook until heated through. Remove pot from heat; stir in lemon juice and dill. Yields about 1 1/4 cups per serving. For anyone that’s been asking and hoping for more recipes on Cora & Louise, you owe Bowling Green Living Magazine a big THANK YOU! (As do I!) Last month, the editor emailed me about a new magazine coming to town & asked if we could collaborate. We met for coffee, started dreaming up our first shoot, and got to work the next week! Every month I’ll be working for Bowling Green Living Magazine to create & photograph beautiful new recipes for their food section. For those of you who don’t live in Bowling Green, don’t worry, you’re still in luck! Even though you won’t be able to get your hands on a physical copy, I’ll be posting the recipes from each issue on the blog so you can keep up! It’s also a chance for readers of the magazine to get to see additional photos & writing that can’t make it into the magazine each month! I’m so grateful our city is getting the chance to have a great publication like this & for the opportunity to contribute to it every month! It’s been such a blessing to finally weave the blog into my normal workload and not have to create extra time to try to work on photographing food. I’m so glad I’ll be able to share much more frequently and consistently! Be on the lookout for one or two new recipes each month — I’ll be posting in conjunction with when the new issue hits the stands! Today I’m posting the first two recipes for the January issue that is available all over Bowling Green today! Be sure to go and find yourself a copy to see and read more. It's available at all sorts of places around town — restaurants, banks, hotels, pharmacies and storefronts! Once hot, add oil, onions, and garlic. Sauté for 2 minutes, stirring frequently. 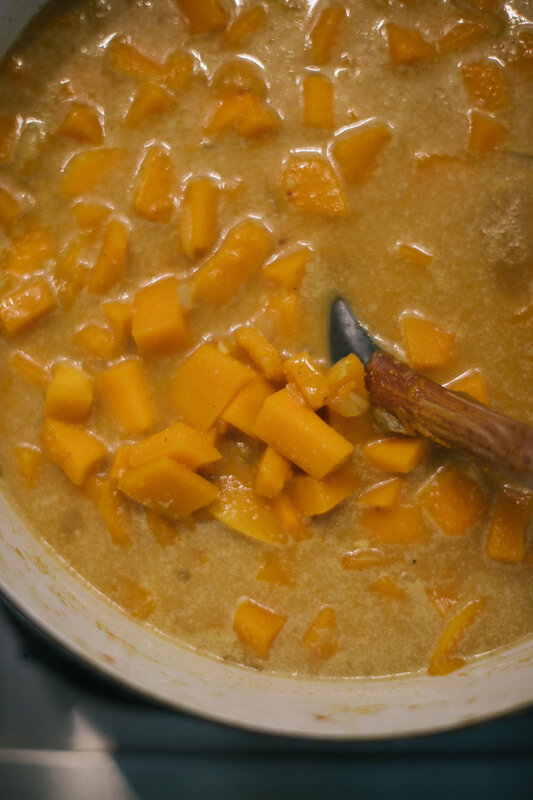 Add butternut squash and season with a pinch each salt and pepper, curry powder, ground cinnamon, and red pepper. Stir to coat. Then cover and cook for 4 minutes, stirring occasionally. Add coconut milk, vegetable broth and honey. I believe great neighbors are a real treasure on this earth. I learned this growing up at 312 High St. living next door to one of the best neighbors ever. Cheryl Galvin was a gem and I will never take for granted how lucky our family was to have her beside us at 314 High St. She took me to see The Nutcracker, decorated Easter eggs with me, and helped me many mornings before school when my mom couldn't get the toe seams in my socks just right. She was very much a part of our family — I even called her my Aunt Cheryl. Of course you don't realize how spoiled you are with great neighbors until you don’t live beside them anymore. After my mom got pregnant with my younger brother, Graham, we moved to the other side of town into a bigger, one-story home. Even still, we found ourselves back on High St. with the Galvins celebrating special occasions, holidays, and most importantly, chili nights. Cheryl was the queen of making chili. I've tasted plenty of chili in my life, but this is the recipe I grew up on and the one I still make to this day. Cheryl's chili is a bit spicy. (My favorite part!) I remember my sister, Megan, and I used to watch our dad eat so we could tease him when the heat from the chili made his bald head break into a sweat. I remember Cheryl's giant chili pot that Megan could climb into and sit down in when she was a little girl. I remember how Cheryl used to house some very special international students who would request her chili when they would come back to visit. I also remember a smaller chili pot (without beans) always sitting on the stove for her daughter, Heather. But most of all, I remember Cheryl and how this chili was only one of the million ways she loved her family and invited people into her home. Cheryl passed away in the summer of 2012, but I think of her often — especially when the weather gets cold and her chili recipe comes out. I will keep feeding it to the people I love & I hope one day I can be half of the neighbor she was to my family, and maybe even become someone's unofficial aunt. 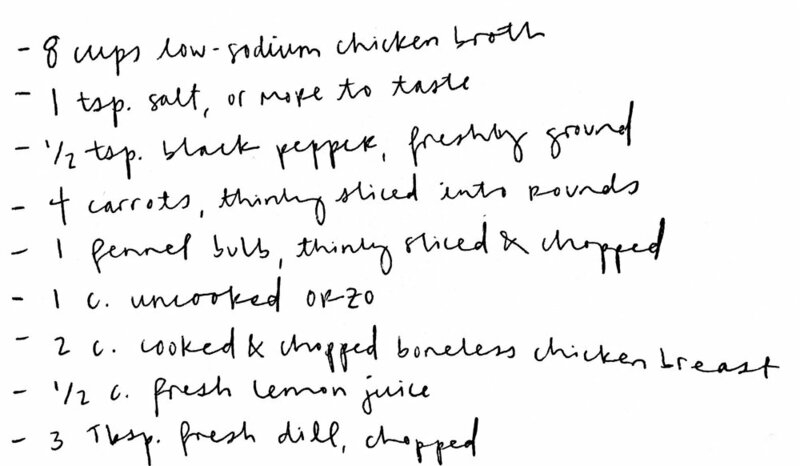 *Disclaimer* — even though you may follow this recipe perfectly, it will never taste as good as Cheryl’s! Brown hamburger and onion — drain off grease. Empty all cans into a pot and add hamburger and onion. Stir ingredients, cover with lid and simmer for at least two hours. Add in cooked spaghetti noodles 30 minutes before serving. Serve in big bowls with lots of cheese & crackers! 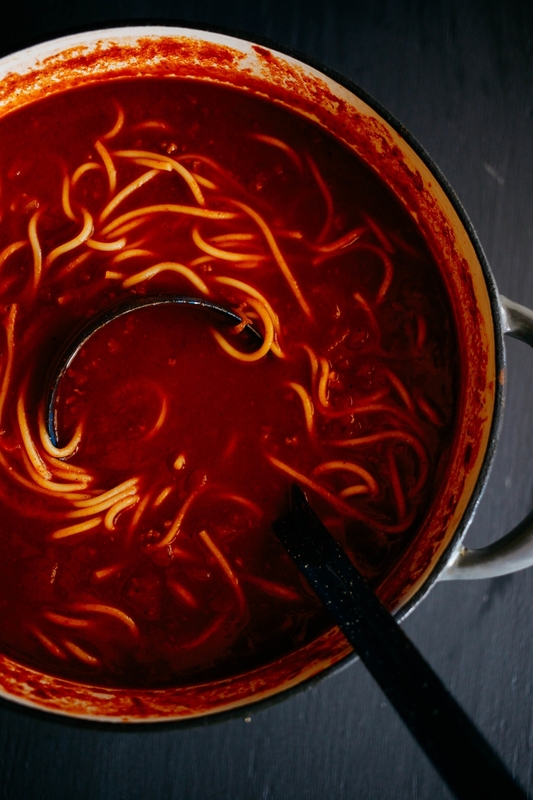 Growing up, there were very few foods everyone in our family unanimously agreed to love. (Bless my mom.) 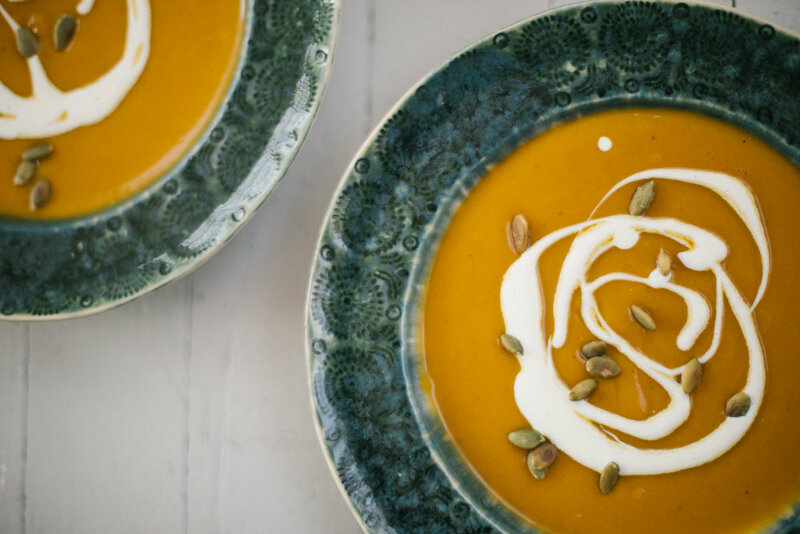 Besides loving ice-cream, the only time everyone in the Meek family came around the table and got excited about dinner was when a pot of soup took center stage. Chili, taco soup, potato soup, tomato soup, you name it — everyone was happy and full after soup nights. Our family bonds over filling up big bowls and crushing crackers, sprinkling cheese, dipping grilled cheeses and scooping tortilla chips until every bite is gone — then filling up our bowls again. One of my moms go-to’s when the fridge felt empty and she didn’t have time to make a big dinner was to heat cans of tomato soup and start buttering bread for grilled cheeses. One of the most comforting meals and one that was bound to please. I think she learned from the best. She told me this was exactly what Louise used to do when she didn’t have time to fix a big lunch on Sundays after church. My parents would go over to my grandmother’s house for lunch and she would fix tomato soup and grilled cheeses for everyone to eat. 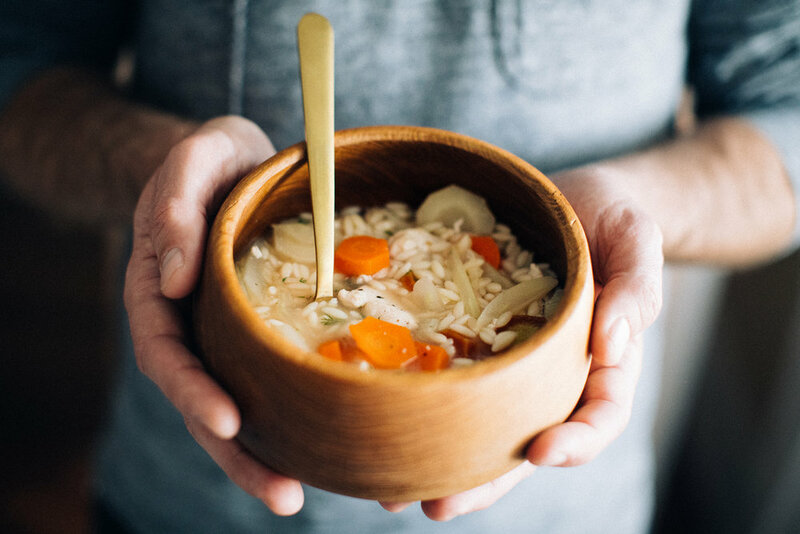 The simple and comforting power of soup and the way it can satisfy so many stomachs — especially of the people I love most is one of the reasons I most love fall. Not to mention I love throwing everything delicious in a pot and using crusty bread as a utensil for eating — that is my kind of meal. So, in celebration of fall and eating one of the most comforting foods of all, I give you Roasted Tomato Soup — it’s quite a step up from the soup you’ll pour out of a can and surprisingly not much harder. Buy the best tomatoes you can find, roast them up, call some people you love and tell them soup and grilled cheeses are on the menu. I promise it will be delicious in more ways than one. 1. Preheat the oven to 350. Cut the tomatoes onion into wedges. (Use your fingers to push out the seedy parts of the tomatoes. This is not a deal breaker, just get out the bigger seedy parts.) Spread them on a baking sheet. 2. Drizzle with the olive oil and sprinkle the salt, a good amount of pepper, chopped parsley and gently toss it with your hands. 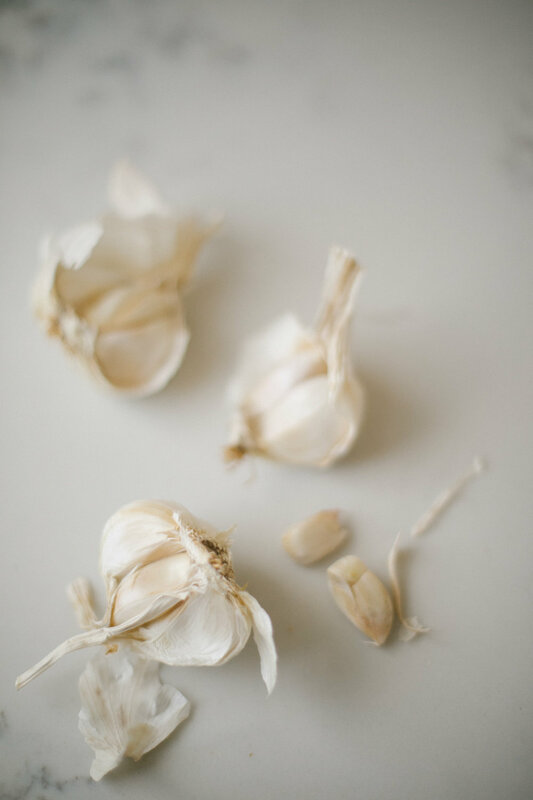 Tuck the garlic cloves somewhere inside of a tomato, so they don't burn. Roast on the middle rack for 30-40 minutes until the tomatoes have broken down to about half their size. Remove and cool slightly. 3. Warm the broth and stir in the tomato paste to dissolve. Add the ingredients from the roasting pan into the broth and let it gently simmer for 5-10 minutes. Use an immersion blender, food processor or blender to puree the soup. (The soup should be smooth, with some texture.) Return soup back to the pot, and add the cream or half & half. Add salt and pepper to taste. 4. Garnish with basil or oregano and serve with crusty bread or make a grilled cheese to help eat up all the goodness! 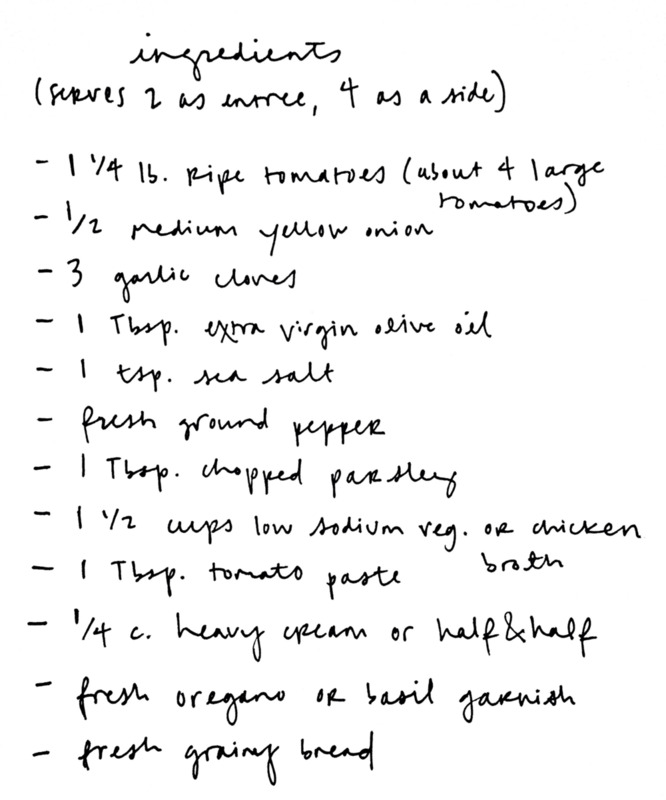 This soup can only be as delicious as the tomatoes that you use — so don't skimp out and pick sub-par ones! The more flavorful tomatoes the better — if you have a friend with a garden or a local farmer's market this is the time to take advantage. Enjoy is on a crisp fall day and please feed a bowl full to at least one other person you love!